Chief Keef has been in some form of legal trouble ever since we met the young man. At first, it was endearing, myth-building stuff: “Hip-Hop’s Next Big Thing Is On House Arrest at His Grandma’s,” that kind of thing. Quickly, it turned grisly and ugly: In September, when a rival Chicago rapper named Lil JoJo was murdered while riding on the back of a bicycle, Keef sent out a leering, ugly tweet, which led to a Chicago Police Department investigation into his possible involvement in the killing. Now it’s just getting bizarre. 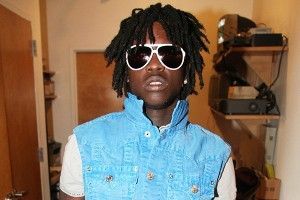 As the Chicago Tribune reports, Keef was jailed on Tuesday for violating his parole. The violation in question? Shooting a video for Pitchfork. Pitchfork has yet to comment on Keef’s probation violation, although what could they really say? They’ve already apologized and retracted the video, a move now only more justified by this new situation. Some will surely use the occasion to reengage in the debate around Keef, and the complicated fact of his embrace by media outlets — Pitchfork, most notably — that aren’t primarily hip-hop publications. Meanwhile, Pitchfork has to figure out exactly how they found themselves in this situation. First order of business, hopefully: an internal order for more laser tag videos.